Is a Megaflo unvented cylinder really the best you can get for your home? Many older homes have traditional heating systems with a cold water tank in the attic which feeds water to a vented cylinder on the next floor down. The water is then heated either directly by the cylinder’s immersion heater or indirectly by a boiler. The main issue with this setup is that the water pressure relies on gravity i.e. the greater the distance between the tank and the cylinder, the stronger the flow of hot water from your taps. This is why taps, baths and showers on upper floors often suffer from weak water pressure. An unvented cylinder removes this problem as it is fed cold water directly from the mains, bypassing the need for a tank in the attic. This means a stronger flow of water from all your taps no matter where the cylinder is installed. Find out more about Vented and Unvented Cylinders. Unvented cylinders are hugely popular with homeowners and widely recommended by heating professionals, but which model is the best choice? We’ve compared the 2 leading unvented cylinders, Megaflo* Eco by Heatrae Sadia and Greenstore by Worcester Bosch, to help you make the right choice for your home. *Megaflo is a brand of unvented cylinder from Heatrae Sadia but you may come across it referred to as Megaflow or even as a megaflow boiler. We’ve chosen to compare the most popular unvented cylinders from the 2 leading brands, both of which can be partnered with any brand of boiler. They offer roughly the same capacity and both are suitable for the average 3 bedroom home with up to 2 bathrooms in terms of capacity, but a professional engineer will need to assess your home to ensure you get the right size. If you need advice about the best cylinder for your home, send us an enquiry and get quotes from professional heating engineers. When comparing any unvented cylinders a big factor is obviously going to be whether or not it can meet your hot water demand. Both the Megaflo Eco 170i and Greenstore SC-180 are capable of supplying enough hot water for the average 3 bedroom home with up to 2 bathrooms. The Greenstore has a greater capacity by 20 litres so if your family has a particularly high demand for hot water this may be a deciding factor, but the Megaflo offers a stronger flow rate by around 11.5 litres per minute. The Greenstore will take marginally longer to reheat than the Megaflo. Megaflo claim this is down to their ‘high performance coil-in-coil heat exchanger’, but then the Greenstore has more water to heat so, logically, a slightly longer reheat time is to be expected. These cylinders are designed to be indirectly heated which means they are connected to and heated by an external boiler. A positive point to note is that both models include a 3kW immersion heater which can heat your water using electricity; this provides you with a backup source of heat should your boiler fail for any reason. A point of difference here is the Megaflo Eco’s ‘unique L shaped’ immersion heater which maximises its heating capacity. Note: If you are replacing a vented cylinder with an unvented model you need to be sure that your existing pipework will be able to cope with the increased water pressure. 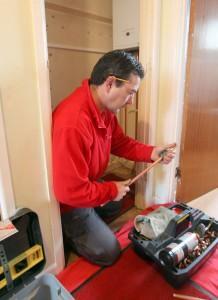 Energy efficiency is crucial when it comes to keeping your heating bills as low as possible. In this area both Megaflo and Greenstore are pretty equally matched with an ErP rating of B. Each cylinder is made from Duplex stainless steel and is insulated by 60mm of foam to ensure maximum heat retention. Over a 24 hour period the Greenstore will lose slightly more heat than the Megaflo by 0.6kWh. A small difference, but a difference nonetheless. While any qualified* engineer will be able to install either cylinder relatively simply, the Megaflo does offer an advantage. As the water in your cylinder heats it will expand; to cope with this every unvented cylinder has an expansion vessel to avoid too much pressure building up inside. The Megaflo doesn’t have an external expansion vessel but instead has an internal air gap with a floating baffle. This makes installation simpler and quicker which could save you money in terms of the engineer’s labour costs. The Greenstore and most other brands need an external expansion vessel. While Megaflo doesn’t have an external expansion vessel, the air bubble within it will need to be re-added from time to time as part of your annual servicing. The Megaflo Eco is also shorter by about 10cm which could make it more suited to homes with restricted space. If the size of the cylinder is a significant factor for you, it’s worth considering the Megaflo Eco Slimline which has a smaller diameter of 491mm. *To be able to install an unvented cylinder an engineer is legally required to have a G3 Unvented Hot Water qualification in addition to being Gas Safe registered. Neither of these cylinders are solar compatible, but both brands offer alternatives if you have solar PV or solar thermal panels, or would like the option of installing them in the future. The Megaflo Eco Solar is compatible with a solar thermal system. Solar thermal panels are fitted to the roof where they capture the sun’s energy and transfer this heat to the water in your cylinder. The Megaflo Eco SolaReady has been pre-fitted with the wiring and components needed to make a solar thermal installation as simple as possible. The Megaflo Eco Solar PV Ready is able to use the surplus solar electricity generated by PV panels to power the immersion heater. The Megaflo Eco Solar PV Ready cylinder works alongside a solar power diverter called the Megaflo Buddy which continually monitors your solar energy use. When the Buddy detects that your panels are generating more than your appliances are using, it diverts the surplus energy to the immersion heater in your Megaflo cylinder. This means you use free solar energy to produce hot water, use less electricity from your supplier and lower your bills. Worcester Bosch do not offer as many solar compatible options but the Greenstore TC range of unvented cylinders is designed for use with solar thermal panels. There are 5 sizes available between 150 to 300 litres. In both cases the cylinders are made from high quality, anti-corrosion Duplex stainless steel. This results in a long guarantee of 25 years with the Greenstore and an impressive lifetime guarantee with the Megaflo (for domestic installations). However, it’s worth noting that these guarantees only cover the cylinder itself; other components and controls are covered by 2 years in both cases, with the exception of Megaflo’s cold water combination valve which is covered by 5 years. Megaflo offer a longer guarantee but if you have or are intending to purchase a Worcester Bosch boiler you may be entitled to a longer warranty on it if you install it alongside a Worcester Bosch cylinder, filter and controls. As the market leaders both these cylinders sit at the higher end of the price scale at £800 or more. As a general rule the Greenstore tends to cost between 10-20% more than the Megaflo, but this will vary depending on the supplier and the cost of having it installed by a professional. An unvented cylinder with a smaller capacity could be as little as £400 while the biggest can reach up to £2,000. Find out how much it will cost to install an unvented cylinder in your home by sending us an enquiry today. We’ll provide you with competitive quotes from fully qualified installers in your area so you can compare and choose the best. The reality is that choosing either cylinder for your home is a great choice. This is especially true if you’re replacing an old vented cylinder as you’re likely to see an improvement in the pressure of your hot water thanks to the mains supply. Depending on the energy efficiency of your current cylinder, it’s also likely you’ll be able to reduce the amount of energy used to store your hot water which could in turn reduce your bills. And with the backup of a 3kW immersion heater in both models you’ll still have access to hot water in the event of a boiler breakdown. The cylinders are made from high quality components including Duplex stainless steel and have been designed to stand the test of time with lengthy warranties. In some areas it seems that the Megaflo has the edge on the Greenstore. It’s a more compact model with a shorter height and no external expansion vessel which could be a great advantage in some homes. It also delivers a stronger flow rate of hot water, loses slightly less heat than the Greenstore, reheats quicker and usually costs less to install. However, the Greenstore’s longer reheat time, higher heat loss, bigger size and price should be balanced with the fact that it holds 20 litres more water. And, when you consider that the Greenstore only loses out to the Megaflo by a margin in most areas of comparison, the Greenstore’s higher capacity could be enough to tip the scales. Do you need an unvented cylinder? Get quotes from up to 3 Gas Safe engineers in your area now.